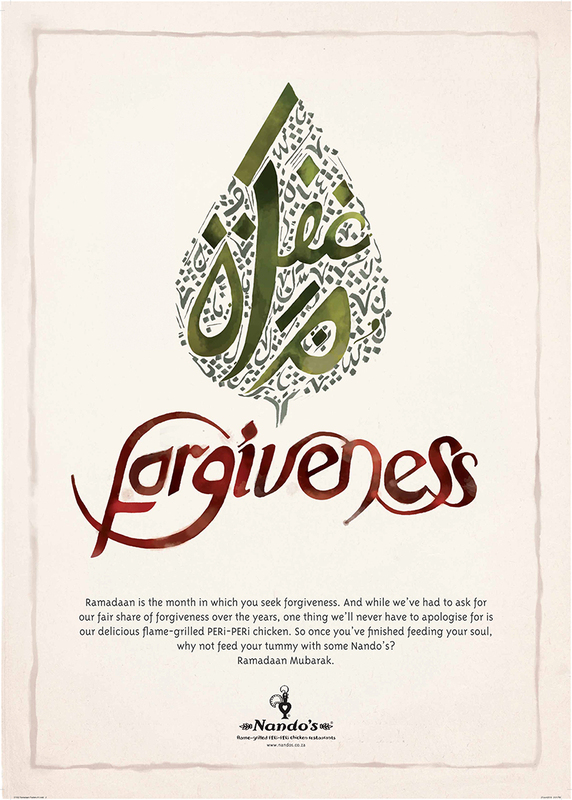 Its that time of the year again, a time of reflection, sacrifice, patience and forgiveness. Yes, its Ramadan. A time when Muslims observe the fast and abstain from food and drink from sunrise to sunset. It is not only about abstaining from food and drink, but a time in which we reflect on those who are less fortunate, and abstain from that which harms us, physically or mentally. It is also hoped that this carries on through out the year and not only for this month. Nandos has once again taken this month into consideration and come up with 3 clever posters. Have you spotted them around? Let me know in the comments below and stand a chance to win some Nandos vouchers, easy as that. 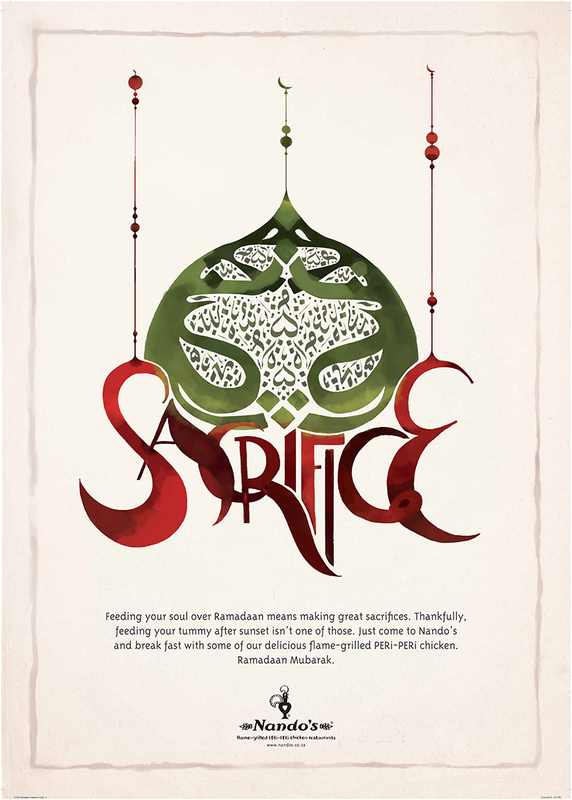 Homepage » Life » Ramadan: What does it mean to you? 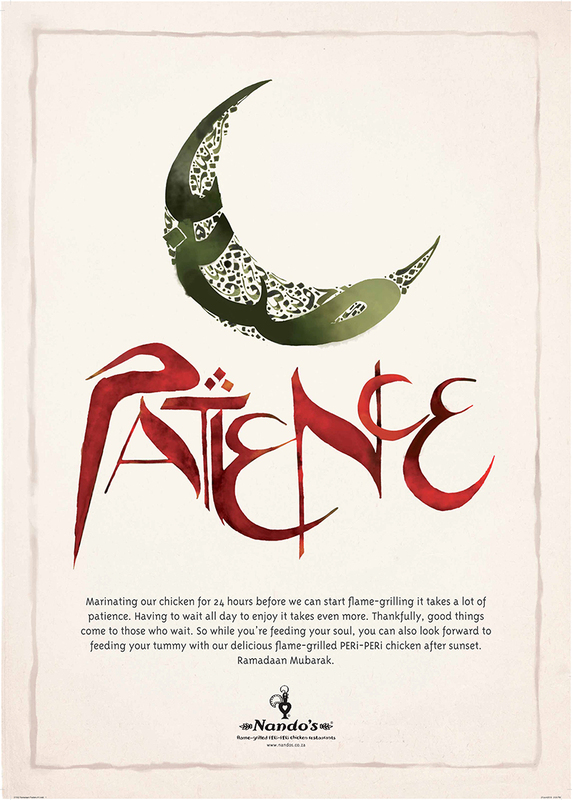 6 Comments to Ramadan: What does it mean to you? It is really wonderful being amongst the admirable and honourable Capetonian Muslims in this blessed month. Masha-Allah, They truly do know the real meaning behind the word sacrifice. Whereas before Ramadan, many of my fellow Muslim commuters would engage in endless scandal of a frivolous nature, debate on the proper usage for key swear words and engage in mutual train-carriage coitus; now they are all in a more exalted and enlightened state. Gone are the toit-pant (tight pants ) that were so fashionable with the ladies a mere 200 hours ago and had many a fella shifting his way out of the train rather embarrassedly. Now everywhere I look its easy to spot a Muslima – just pick out the toiter-doekies (tighter scarves) and not-so-toiter-pant (Not that I have been looking, mind you). Gone are the happy puffers, smoking their lungs out while cursing metrorail with a profanity that would make even a tsotsi whistle. Now everyone can be seen with a Surah Yasin with the English transliteration and some even have their train tickets stapled to the front so they don’t forget it at home… of course. They recite it in their numbers and I am sure that if CNA started stocking these, it would knock Dan Brown right off the bestsellers. Gone are iPods and MP3 players blaring the latest BEP record, its all been replaced with Quranic recitation. Abdul Basit, Mishary, Al Ghamdi, you name it, its all on the playlist – and played at maximum volume so that everyone in the carriage knows that you are on a higher-spiritually acoustic level. Gone are the tattered and self-mutilated denims so popular with the Muslim guys. Hey, now were all wearing our thobes with pride. We have even given up on styling our hair with that organic whale urine we used to use every morning. Now its kuffiyah (fezzes) all the way! Some of us have even started growing beards in this month, (some women too) – a true indication of our commitment to the Deen (faith) of Allah. And the afternoon rush is truly a blessed sight: traffic gets backed up and nobody curses, nobody swears, road rage statistics are down to 15%, although as it gets closer to iftaar this figure is bound to shoot right up – another indication of our undying commitment to get home in time for Ibadah (prayers). Of course we wouldnt be rushing off like this for the faloodas and samoosas and dhaltjies and so on. That would be just wrong. I truly am proud to commute with such fine and admirable Muslims during this blessed month. I wonder how many of them will bring along their Yasin Surahs once their monthly ticket expires. Insha-Allah, hopefully all. Sacrifice in the month should translate through out the year. May this Ramadan be a blessed one for you and your family and may the rest of the year be as blessed. I just asked Raeesah﻿ who Ramadan was. In life, you live and you learn but I wouldn’t have known what Ramadan is. Now that I have a slight idea, to me it means a time of fasting – sacrifice. In sacrificing food and water, you offer generosity in thinking of those who are less fortunate, for when you understand their situation, you assist them and get to appreciate what God/Allah has provided you. Sacrifice – Help – Appreciate! You are correct, it is a month of sacrifice, but it is not only for Muslims, it is for everyone all year through. What can you sacrifice for the next person, in the eyes of God. i got this from an anonymous poet that just sums up all replies to what Ramadaan should make you feel and how to tackle this month and from then use it as a guide to treat the remaining ones to come.